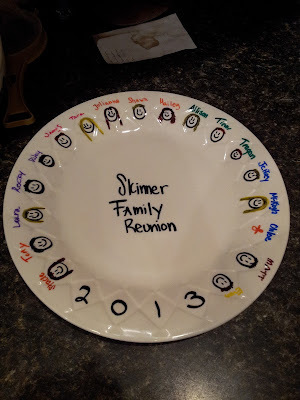 Ever since I found out we were having a family reunion in July , I thought it'd be a great idea to do a "Pinterest Party". I asked all the girls to bring a craft that we could all do and here is one of the ones we did. My sister Allison was in charge of this one. We went to thrift stores in the Boise area and picked out white dishes. You can use cups, bowls or plates. Then we used Sharpie markers to draw a design or write a phrase. My sister Laura (above left) traced her little 1-year old's hand. My sister Allison (above right) wrote a saying she liked. You can use a damp paper towel to erase lines in case things dont go as planned. And here is how I decorated the outside. Once you are done with your designs, you bake the dishes in the oven for 30 - 40 minutes at 350*. Make sure the ink in your designs is completely dry before putting your project in the oven. If the ink still smudges after you take the dishes out, try baking for a little longer. That's what we did and it seemed to work just fine. My sister Allison made this & we all signed it and she gave it to my parents. Pretty cool gift I thought! This was a fun project to do and didn't take a lot of time & wasn't complicated. I LOVE this! My four year old would go crazy over this project and it would be fun to design something for chirstmas gifts! That's so awesome! Pinterest is full of so many different crafts I never would have even thought I would find. I love finding so many great ideas!! Fun, fun! Awesome idea! Might have to use this idea to make some Christmas gifts - maybe having my niece and nephew involved in it as well.